Roger Author GFX Related / Drawing & Graphic Designs. Draw a sketch which is better than the photograph! 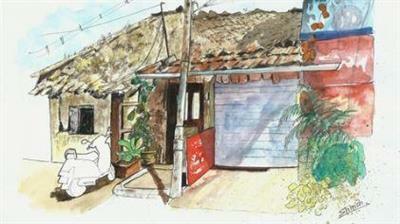 I am delighted to create this course teaching how to draw a full painting of this charming hut. 1. How to do a preliminary pencil sketch of a structure like this? 2. How to convert this pencil sketch into a pen sketch? What precautions need to be taken when starting with the pen sketch? 3. How to apply colors to the sketch? How to use colored inks and watercolors interchangeably and in harmony? 4. Dry brush technique for indicating the textures.